It is certainly no industry secret that in year’s gone-by and previous generations of children benefiting from extended amounts time outdoors and often unsupervised. Many adults, who experienced this first hand, look back fondly on these early experiences. It is commonly recognised these experiences made (and make) a positive impact, and as adults we are aware that it shaped many elements of our own health and development. Even though the developmental needs of children today have not changed, the fears felt by adults about increased traffic and perceived threat of child abduction has led to a shift in society in terms of attitude towards children’s access to and importantly use of the outdoor environment. What’s more, with the ever growing interest and use of media equipment such as computers, televisions, mobile devices, tables, this has contributed a society where many of our children now live sedentary lives, with very few, and certainly limited opportunities to access outdoor space or the huge benefits from being outside. Regardless of the cultural shift away from playing and learning in outdoor environments, it continues to be crucial to children’s development, wellbeing and development. Subsequently, the role of early years settings should ensure that they maximise opportunities to play freely and safely outsides is crucial. An early years setting and environment should allow play and learning to flow seamlessly between indoors and outdoors, enabling children to make the most of the leaning resources and materials available to them and develop their ideas without needless interruption. Outdoor learning complements indoor learning and is equally important. Outdoor learning incorporates all that children do, see, hear or feel in their outdoor space. This includes the experiences that their practitioners create and plan for, the spontaneous activities that children initiate, and the naturally occurring cyclical opportunities linked to the seasons, weather and nature. At Timotay, we are here to help you to promote outdoor learning. 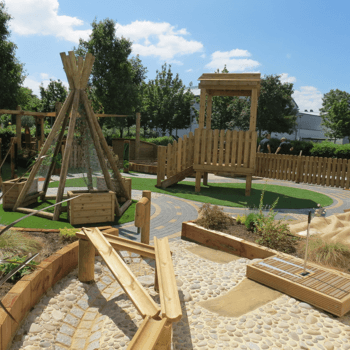 Our Playground Consultants are time served Early Years Professionals and can offer a wealth of knowledge when developing outdoor environments. What’s more, our products provide a great basis for promoting outdoor learning, linking indoors to outdoors and ensuring that all equipment has a play value and objective.